The Rep, in Santa Rosa Beach, presents a very special night of Americana music on Thursday, June 7, 2018. 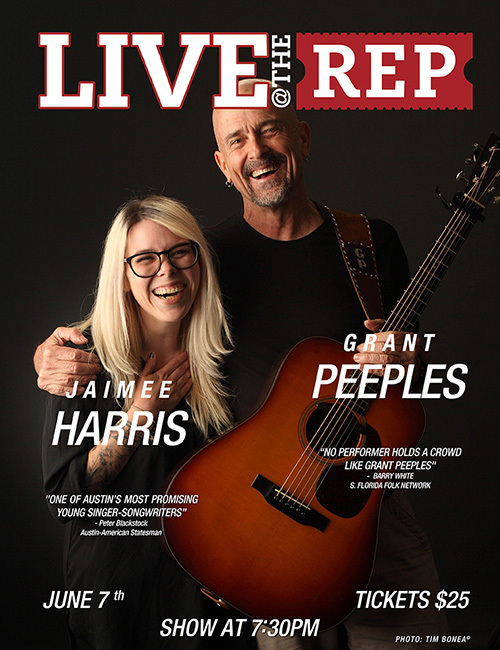 Seventh generation, Florida-native Grant Peeples and Texan songstress Jaimee Harris have collaborated on a limited four city engagement tour and stopping along 30A. Both have been featured artists in the lineup at the 30A Songwriters Festival, but this will be their first visit to LIVE@TheRep. They will be touring together again in Europe, starting January 2019. Peeples and Harris’ consequent collaboration began at Austin’s South by Southwest Music Festival in 2016. “I hadn’t heard of Jaimee but her band was playing before on the same stage. I was in the greenroom and heard her, and went out and listened. She slayed me,” recalls Peeples. Later that year they partnered on stage at the Woody Guthrie Festival in Oklahoma and began a Texas tour run after that. Peeples is known for his sharp socio-political tunes, raucous humor and gruff style. In 2014, he was the recipient of the Focus Foundation Award for Creative Excellence. In 2016, he was a Finalist in the prestigious New Folk Songwriters Showcase, sponsored by Kerrville Folk Festival. He has recorded eight studio albums. Settling Scores Vol. II., released earlier this year, features Harris’ soulful vocals. Jaimee Harris is has been called ‘the next queen of Americana-Folk and ‘an edgier Emmy Lou Harris for the younger generation.’ Her soon-to-be released debut album draws comparisons to Patty Griffin, Ryan Adams, and Kathleen Edwards. As an emerging artist, she was mentored by Americana/Folk icon, the late Jimmy LaFave. Harris’ poetic and relatable lyrics are just as powerfully striking and commanding as her voice. The show starts at 7:30 pm Thursday June 7th, doors open at 7 pm. The show will feature solos by Peeples and Harris, as well as duets. LIVE@TheRep shows are performed in the Seaside Meeting Hall Theatre, located at 216 Quincy Circle in Santa Rosa Beach. Tickets are $25 and can be purchased at www.lovetherep.com. The post Special Americana Concert Upcoming at The REP appeared first on 30A.